If you're pigging out this Thanksgiving weekend, don't worry about a little fat and weight gain. 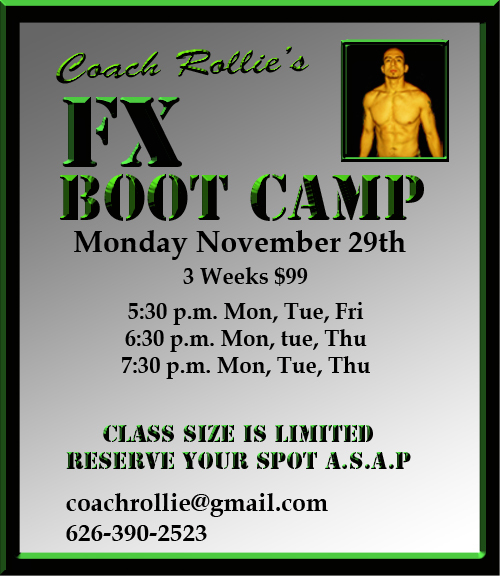 My FX Boot Camp in Pasadena restarts this Monday November 29th. The goal for my FX'ers will be to lose 2-3 inches around their belly before Chistmas. A deposit reserves your spot, and you can pay via Paypal. Here's a sample workout video that showcases some of the exercises I employ in the FX Boot Camp fitness class. Try a few of the exercises and you'll know why my Fat X Program and my FX Boot Camp workouts are excellent choices when you want to get trim and toned. 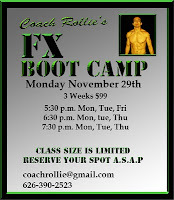 More info about the FX Boot Camp in Pasadena.